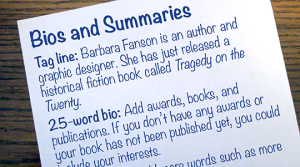 Tag line: Barbara Fanson is an author and graphic designer. 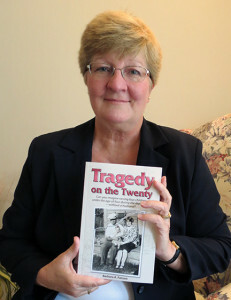 She has just released a historical fiction book called Tragedy on the Twenty. 25-word bio: Add awards, books, and publications. If you don’t have any awards or your book has not been published yet, don’t say anything. 50-word bio: Add more words such as more awards and speaking events that are relevant. 100-word bio: Building on the previous, add more fun or interesting facts and details.